An electrocatalyst is a material which is used to catalyze an electrochemical reaction (i.e., an electron transfer oxidation or reduction reaction). Electrocatalysis is a crucial component to many different energy and industrial applications. In artificial photosynthesis (a process in which sunlight, water, and CO2 are converted to fuels or chemicals) electrocatalysts are used to improve the efficiency of the hydrogen evolution reaction, the oxygen evolution reaction, and/or CO2 reduction. In addition, electrocatalysts are used in fuel cells and metal-air batteries to catalyze the oxygen reduction reaction. Industrially, electrocatalysts are used in electrowinning (the process of extracting metals from their ores), electroplating (the process of coating a material usually with a thin layer of metal), and electrogalvanizing (a corrosion protection method usually applied to stainless steel). 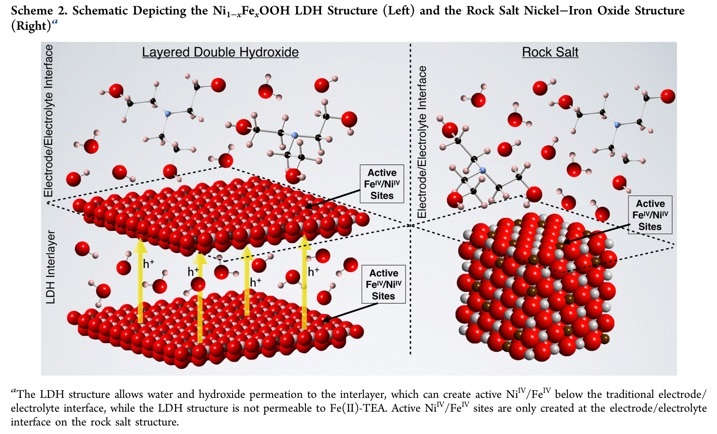 The research goals of the Leonard laboratory include developing new electrocatalysts based on earth-abundant materials for all of the above applications. This encompasses investigating new material compositions as well as novel morphologies based on nanomaterials. In addition, the aim is to improve the understanding of the mechanisms of electrochemical reactions and how they are affected by electrocatalyst properties. 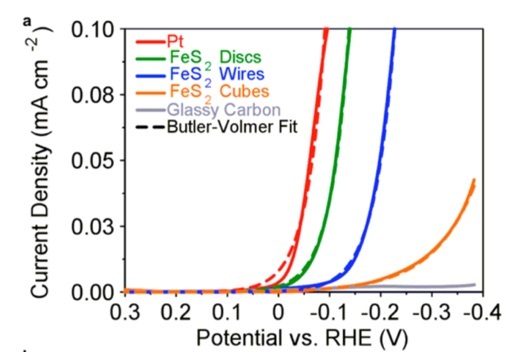 Electrochemical characterization of FeS2 discs, wires, and cubes in 0.1 M pH 7 phosphate buffer solution (PBS) for the hydrogen evolution reaction. (a) Experimental linear sweep voltammograms at 1 mV/s (solid lines) for the champion FeS2 discs, wires, cubes coated on glassy carbon along with a bare Pt electrode, and a bare glassy carbon electrode. Also shown are the corresponding best-fit single-electron Butler−Volmer equations (dashed lines) for each electrode. 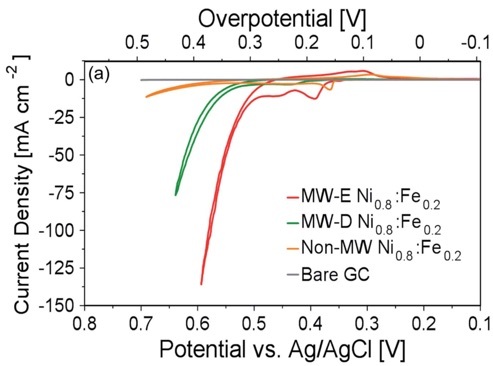 Rotating disk cyclic voltammograms of microwave-assisted electrodeposited (MW-E) and drop-cast (MW-D) nanoamorphous Ni0.8:Fe0.2 oxide on a glassy carbon electrode at 10 mV s-1.